Where I grew up, every young boy (and some young girls) of a certain age became absolutely obsessed with baseball cards. We traded them, we hoarded them, we obsessively poured over the statistics on the back of each card (Imagine that! Seven year olds pouring over statistics! ), and we grew to have 'favorite players' who we'd never even seen on TV, much less in real life. Certain cards became such hot items that the players depicted on those hunks of cardboard morphed into something much more than baseball players. They were larger than life. On yesterday's edition of the Space Show, the show's host (Dr. David Livingstone) and several of the members of Google Lunar X PRIZE team FREDNET were talking about how scientists, engineers, and explorers used to be heroes--but now, our culture has shifted such that many young people today don't seem to have heroes at all--or, if they do, their heroes are athletes and singers. It's a conversation we often have here at the X PRIZE Foundation, where we hope to insert a sense of heroism back into science and engineering, the way there was in the age of Einstein, Glenn, and Gagarin. This thought was percolating through my mind last night, as my fiancée and I watched a very cool TV special called Are We Alone, featuring one of my fiancée's mentors at JPL (Dr. Gentry Lee, Chief Systems Engineer at NASA / JPL). It stuck around as I read that we are having a special guest lecture today at X PRIZE from a scientist who one of my co-workers described as his hero. 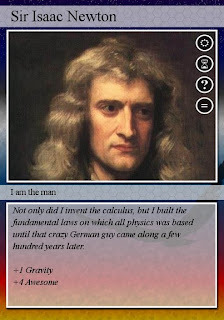 So today's Friday Fun Day Activity is: make a "trading card" like the baseball cards I and so many others obsessed over as a kid--but make it for your favorite scientist, engineer, or explorer (living or dead, real or fictional). Send it to us, with a note about why you like that person so much. We'll collect them all here--and hopefully we'll inspire people to learn about some new heroes along the way! I'll get things started: I was first asked "who is your hero" at a conference when I was nineteen. I thought about it a while, and realized that I had two answers: Sir Earnest Shackleton and Richard Feynman. I'd just finished reading Surely You're Joking, Mr. Feynman. I loved the man's intellectual curiosity and his quirky personality. Later, I'd be floored by the quality of his collected lectures on Physics. Just superb. 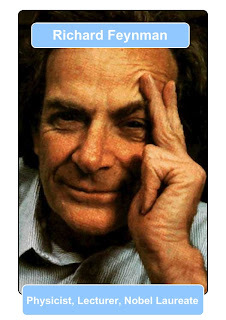 I've gone on to read many other Feynman books, and have found them all entertaining. I remember getting some very odd looks when I was reading QED: The Strange Theory of Light and Matter on breaks when I worked as a surgical assistant (a VERY trumped up name for a O.R. Janitor) when I was 19. It was worth it. Submission from @amoroso: Giovanni Virginio Schiaparelli, of Mars canals fame, is my favorite scientist since I was a kid because he was a great observational astronomer. I ended up using his telescope and doing guided tours to his observatory as part of my science outreach work. 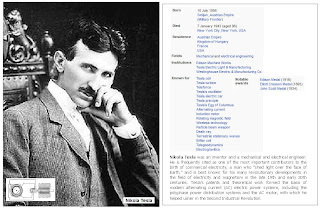 Image in the public domain from Wikipedia, captions added by @amoroso. Note from Will: Great call, Paolo! For those of you who didn't know, you can view Schiaparelli's maps of Mars in Google Earth! Note from Will: See, this is working already! I was not familiar with Dr. Kaku's work before. Now I have an excuse to look him up! Courtesy of commenter Simonvdb. He writes "I have just finished the impressive biography of Sergei Korolev by James Hartford. This it THE man who put the Russians into orbit, so not one to be omitted from the true collector's card collection ;)"
Wikipedia notes: Although trained as an aircraft designer, Korolyov's greatest strengths proved to be in design integration, organization and strategic planning. A victim of Stalin's 1938 Great Purge, he was imprisoned for almost six years, including some months in a Kolyma gulag. 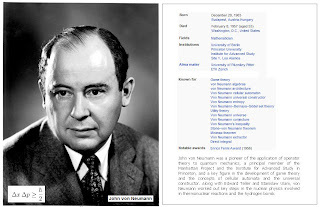 Following his release, he became a rocket designer and a key figure in the development of the Soviet ICBM program. He was then appointed to lead the Soviet space program, given the rank of Academician (Member of Soviet Academy of Sciences), overseeing the early successes of the Sputnik and Vostok projects. By the time he died unexpectedly in 1966, his plans to compete with the United States to be the first nation to land a man on the Moon had begun to be implemented. Google Lunar X PRIZE team member and recent SpaceVidCast guest Jason Dunn was the first to take me up on the "or fictional" part of the day's activity. He submits a card for Doc Brown from the Back to the Future film series. Jason writes: "Doc Brown: a man who is ready for the future and isn't afraid to confront his past. Plus, he drives a Delorean!" 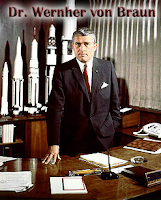 From @flyingjenny: "Dr. Wernher von Braun, steely-eyed rocket doctor." Gotta love it. Well, that's brings today's activity to a close! Thanks everyone for the great suggestions and for the many, many retweets--this was one of our better received #FFD activities. Feel free to keep leaving thoughts about your science, engineering, and exploration heroes in the comments!